In the flurry of all-news cable coverage of the whirlwind that is the Trump presidency, the details get lost. It’s hard to tell what’s really going on when Fox News is busy claiming there’s a caravan of immigrants about to storm the U.S. border, or is busy attacking Jimmy Kimmel for some wisecrack he made. And CNN is busy trying to help viewers connect the colourful, shady players who turn up in the Mueller investigation. Every now and then, somebody will assert that the Republican Party is a disgrace, a bunch of wusses intimidated by a braying bully of a know-nothing. Or somebody will simply acknowledge that Trump put the party in his pocket and will then look puzzled about why it happened. The bigger, better picture can be found in the excellent, plays-like-a thriller Frontline: Trump’s Takeover (Tuesday, PBS, 10 p.m.). It’s essential viewing for anyone trying to follow the twisted tale of Donald Trump’s appropriation of the GOP, and how everything turned upside-down. 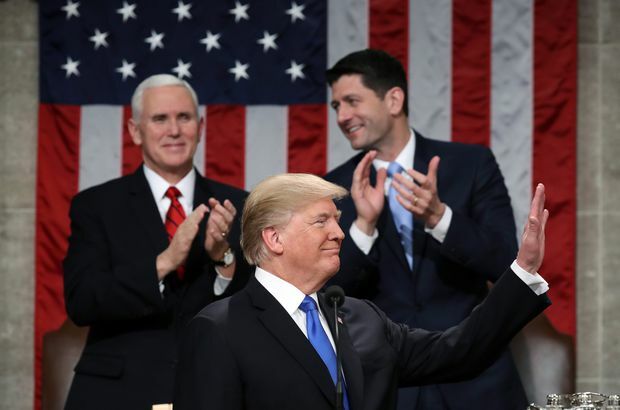 President Donald Trump is applauded during his State of the Union address by Vice-President Mike Pence, left, and Speaker of the House Paul Ryan. It has the usual suspects offering insight and eyewitness accounts of arguments and hissyfits. Some, we haven’t seen for a while, including Sean Spicer, Corey Lewandowski and Kellyanne Conway. Other figures, such as Republican Senator Jeff Flake, talk at length, and ruefully, about Trump making lapdogs of powerful politicians who thought he was a coarse, unproven outsider in Washington politics. The menu was, obviously, not Trump’s kind of meal. But his main interest was in seeking out and attacking Republicans who had been critical of him. In particular he wanted a word with Jeff Flake. As Flake explains, “My only thought about him and politics was the conspiracy theory that he not only espoused, but really forwarded, about the President’s birthplace.” Flake thought Trump’s “birther” conspiracy theory about President Barack Obama was vile, unworthy of any serious politician. Trump simply told Flake that the Senator would lose in the next election. It was blunt statement, not even a veiled threat. “Somebody needs to stand up and say, ‘This is not our party. This is not behaviour that we should condone. We shouldn’t be okay with this. This is not normal,’ ” Flake says in a far-ranging interview for the program. And, of course, he decided not to seek re-election after his current term ends. Much time is given to the lurching attempts to repeal and replace Obamacare. The backroom meetings, the phone calls and arguments. What emerges is a scenario that has nothing to do with ideology, let alone health care, but everything to do with a “win” for Trump himself. The hour-long program is one that justifies the existence of PBS for many Americans. It’s a sober, thorough investigation, but gripping and commercial-free. It asserts that the Republican Party has been “Trumpified” but that this amounts to “a Faustian bargain,” one that hasn’t yet reached its ugly conclusion.